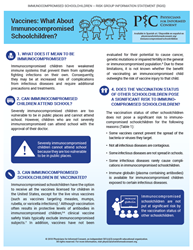 The Immunocompromised Schoolchildren Risk Group Information Statement was developed to address concerns about the risks that the vaccination status of schoolchildren might pose to their immunocompromised classmates. ...some vaccines fail to prevent the spread of the bacteria or viruses they target, which means certain infectious diseases, such as pertussis (whooping cough), are spread regardless of a child’s vaccination status. The nonprofit organization, Physicians for Informed Consent (PIC), has released an information statement entitled “Vaccines: What About Immunocompromised Schoolchildren?” Because immunocompromised schoolchildren are among the most vulnerable children in school, this educational document focuses on concerns about their safety and addresses questions about the risks that the vaccination status of schoolchildren might pose to their immunocompromised classmates. "The scientific evidence shows that the vaccination status of a child is not a significant risk to immunocompromised schoolchildren," said Dr. Miller. "Therefore, it is both unscientific and unethical to use coercive measures to increase vaccination rates."